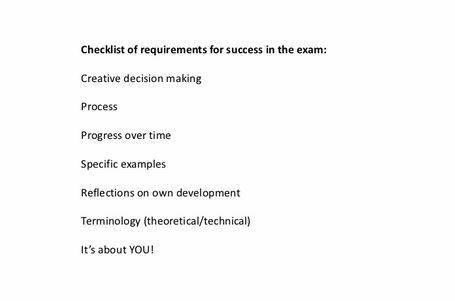 YOUR SKILLS REVISION BOOKLET – Important! In the next few lessons, you will be doing reviewing and redrafting your skills essays and ensuring your skills template is complete. We will be doing the final Skill, Conventions, as a timed essay in class at the end of the week. These are advice tweets we received from the Chief Examiners a couple of years ago as a reminder about Section A. Be specific and be chronological. It is about the process, the decisions you made and the impact on the outcome. Always conclude with your final product and how much more skilled you are and how your improved skills have affected your final product. Remember, use T + E + E (explain instead of A – analyse) and S (particularly if creativity is involved). S = how much more creative, original, unique, new, inventive did you or the product become. You could use synonyms for ‘process’ and ‘decisions’ and keep these in mind when writing the essay and keep mentioning them in relation to your examples. This is a celebration of your learning journey and the decisions you made and how they helped you improve. Intro; what skill are you talking about and what do you understand it to encompass – i.e. what is C, DT, R + P and PP – very short. and briefly outline which projects you did i.e. preliminary, thriller, swede, music video (title of song and performer) and print products + very, very short overview of the type of skills, tasks, exercises, techniques, conventions or documents you used in AS and A2 in that particular Skill area. If time is an issue – scrap this in preference for the stories below. (Skills Story 1)should pick up on one of the specific skills listed above and suggest something about your starting point with it – give an example of how this progressed from start to finish and probably how it affected your creativity as a media student. (Skills Story 2) choose another one of the skills listed and do the same as above – use examples. (Skills Story 3) choose another one of the skills listed and do the same as above – use examples. (Skills Story 4) choose another one of the skills listed and do the same as above – use examples. Conclusion; short conclusion of how your skills have improved (and how your creativity has developed if appropriate but to be hones, it’s relevant even if it isn’t mentioned in the question). Remember it’s only half an hour and you need to address all your video projects! You can mention other skills that you have learnt and applied to projects outside of school or in school but only if really relevant or spectacular. Explain the most significant ways in which your media productions were informed by your understanding of the conventions of real media texts. Refer to a range of examples in your answer to demonstrate how this understanding developed over time. how your skills in this area developed over time. Refer to a range of examples from your media production process in your answer. specific media production outcomes. Refer to a range of examples from your media productions in your answer. Seems unlikely that research and planning will crop up three years in a row! These are exemplars from previous years.